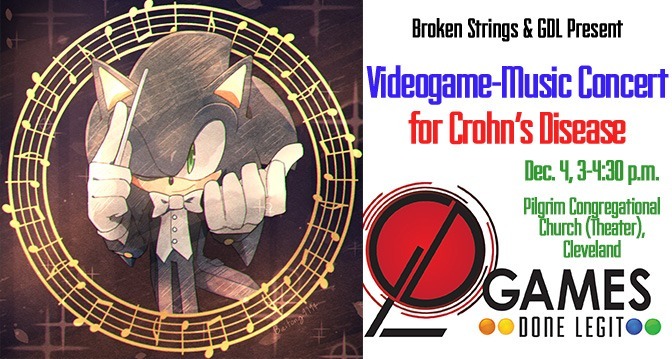 What: A videogame music concert recital, featuring unique arrangements of some of the most beloved music in videogame history, performed by Broken Strings and in partnership with Games Done Legit entertainment. A projection show behind our musicians will accompany them through our pixelated musical journey! Plus enjoy free baked goods the musicians made themselves after in a meet-and-greet! Where: Pilgrim Congregational Church, in the Main Theater (2592 W. 14th St., Cleveland, OH 44113) – Google Maps Directions Church parking lot is free, as is street parking close to the venue. When: Sunday, Dec. 4, 3 – 4:30 p.m. Why: Support the arts and your love of the hobby of gaming at the same time! Christina Wynne and Maria Tarnay have crafted their own arrangements of music from The Legend of Zelda I and II, Metroid, Ori and the Blind Forest, Donkey Kong, Undertale, Kid Icarus, and more, for your listening enjoyment! A special “sing-a-long” encore will close the event that every gamer should recognize. How much: FREE – donation of your choice ($5 recommended) requested to cover venue fee and benefit research for Crohn’s disease, for which there is no cure. Crohn’s disease afflicts one of the performers. RSVP and share on Facebook! Email info@gamesdonelegit.com with any questions! Come out and enjoy this one-time-only gaming event!